There are quite a number of instant coffees on the market today. How will you know the best instant coffee that provides you with tasty coffee? This is why I have reviewed the top brands to help you know which one tastes well. Check out these reviews and I’m sure you will get a brand that meets your coffee needs. This is one of the best Asian coffees from Nestle Malaysia. It consists of 28 sticks in one package. It is more aromatic that before and it now has a creamier taste. This is an improved version of the one before. You do not need you sugar and creamer with this one. The 3 in 1 already comes with all this in one. All you have to do is mix it with hot water and within 30 seconds, you drink is ready for you. It is a must try if you are a lover of coffee. This is the ultimate coffee experience all in one package. Forget about the regular type and try this new and improved version of it. You cannot go back after. This is a house blend instant type of coffee. It is packaged in a very good container that allows for easy storage and light traveling. It is very tasty as its name refers. You can rely on the taste as it is very consistent. The smell is also something to go by. 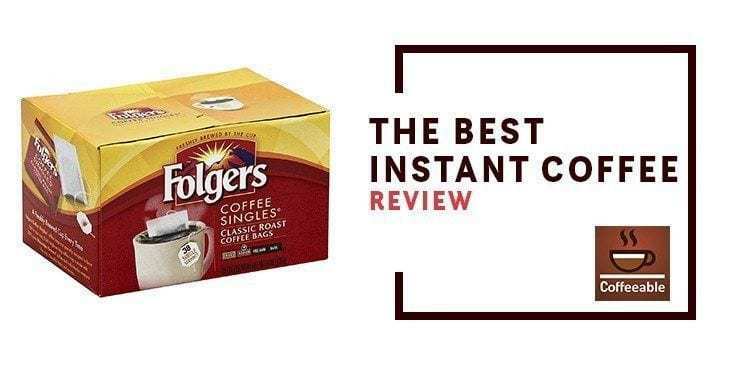 You will be pleasantly surprised with this one if you have never tasted instant coffee before. The taste is medium in strength and very smooth. Adding more coffee to your cup will still not make it bitter or harsh. It makes o a good coffee for someone drinking it for the first time. You will definitely not be disappointed. The Taster's Choice Original Gourmet Instant Coffee taste like no other Coffee you have ever tasted. This is a must try for you. This coffee brand is superior and has a rich blend full of flavor. It is beautifully packaged in a glass jar. This brand is originally made in Germany and it boasts of its high quality. It has a fresh superior taste that is second to none that gives a fresh taste in an instant. Jacobs freeze-dried instant coffee is just as good as fresh brewed. This instant coffee does not have a bitter taste but rather smooth with some element of sweetness. Jacobs Kronung Instant Coffee is a quick and easy cup to prepare. You may need to add sugar or milk depending on how you like to have your coffee. CAcafe is a delicious Colombian coffee, full bodied and made of real coconut. It works well as a very natural flavor and creamer enhancer. There are no preservatives in this flavor, no dairy or artificial flavors added to it. It is a product that boasts of very high quality and a sweet-smelling flavor that you will definitely enjoy. It is healthy and tasty at the same time, adding more value to its brand. This coffee is made of real and whole coconut giving it health benefits that are good for the user. This energizing alteration has helped many to lose weight, grow nails and hair faster and have better skin. These benefits are unique to every customer. There is no harm in trying this amazing product out. Maxim Mocha instant coffee is comprised of coffee, sugar and a creamer that is non-dairy. It is sweet and mild, good for those who prefer a mild kind of coffee. It is fairly priced considering that is of high quality. It is sweet and delicious as well as easy to prepare. It comes in packets so it only needs the user to conveniently drop in hot water and it is as good as ready. This feature also makes it very good for outdoor activities like camping. This Instant coffee can also serve you for a very long time if you are not a heavy drinker. Its flavor is very rich. It can last and last with you long after you take your cup. Maxwell House's great product can be the ultimate coffee creamer for you. You may want to try it because it is very sweet ad delicious. It is almost completely caffeine free with very little calories per each serve. If you are health conscious, you may want to try this one. You can even lock in the freshness as it has a canister that can be sealed again after opening. It is free of sugar and contains dairy. If you are the type to keep Kosher, this product will serve that purpose very well for you. It is also full of rich flavor and smells very good. This Instant coffee is very good for unwinding after a long day. Caffe D'Vita is a great Instant cappuccino. It can be served either hot or cold and still preserve its great flavor just the same. This coffee has been around for a very long time and it is among the favorites of customers in the market. It also does not contain hydrogenated oils as well as zero fat. This makes it good for your health. It gives the customer a rewarding taste that is unmatchable. It is not expensive given its value addition. It is easy to use as all you need is hot water to go. The reviews to this product are very positive and we would recommend you try it for a change. It just may surprise you. What a great coffee to wake up to. Flogers Coffee is sweet and delicious with the best aroma. It contains packets for single serving that are also great on the go. The flavor is also amazing. Its crystals also serve as a great addition to some food recipes. They dissolve simply and blend fast with sauces, butter and other drinks, that instant coffee that fits all sorts of lifestyles. This product blends both concentrated and ground coffees. This increases its variety range to reach a wider range of people. It is easy to prepare. All you need to do is to follow the instruction and let the coffee stay longer in the water before removing it so the flavor can settle. G7 3-in-1 Coffee is a very special product because of the patent placed on its dry roast. This gives it a superior taste that is second to none. It is neither concentrated nor pre-brewed giving it a very fresh taste and sweet flavor. This instant coffee has been dried by freezing thus increasing its quality and value. It is very easy to prepare as you only need to add hot water and stir. Its 3 in 1 ability further enhances its quality again. You get sugar, creamer, and coffee all together ready to go. This Instant coffee is perfect for travelers, office or home use. It is a fantastic all round product that will definitely change your experience. This is one of the best types of coffee for those who love their taste mild. It has a very well balanced and smooth taste. The fact that it is made of a glass jar gives it the ability to lock in the flavor and maintain its freshness. The beans that make this coffee are 100% pure and premium and have been very responsibly sourced. It is very simple to use as all you need to do is follow the instructions provided. All you need to do is add some hot water, stir well and enjoy your fresh and tasty cup. You can enjoy a cup of your Nescafe Taster's Choice House Blend Instant Coffee anywhere and anytime. It is good on the go as well as perfect for home use. Arabica Coffee is an important point to mention here. Starbucks VIA is a readily brewed Italian Roast Coffee that is rich in flavor and ready to drink. Sweetly blended and sourced ethically for the sake of equality. The aroma is so stimulating and refreshing. It is also quick and easy to use, all you need to do is stir after adding hot water and you are good to go. It has a sweet taste and is very favorable to majority of people. It has a very bold and robust taste which gives you a unique experience. While traveling, this could be a good option for you. It is an instant coffee that has you in mind. Coffee doesn't come purer than this. It is made of dark roast giving it a very deep taste. It's very rich and bold in every cup. One taste can work for all. It is very popular because of its exemplary standards. As the saying goes that it all starts with a Nescafe, this is a fantastic way of starting your day. The energy that this drink brings can change your whole day. It has the ultimate taste that makes coffee just what it is, sweet and delicious. The aroma that comes out of Nescafe Clasico Instant Coffee fills the room and brings out life to your soul. This type of coffee is a healthy and mild choice that makes all the difference. Cafe Altura Freeze Dried Organic Coffee is a type of instant coffee that one does not forget easily after tasting for the first time. It is tasty and you will relish the aroma. It is made of very high quality increasing its standards automatically. Weather hot or cold this coffee is delicious. If you want to start your way the perfect way then this is as good as it gets. It gives you the right energy to take you through the day. Believe it or not, you can also use this coffee for baking. Its quality is further enhanced by the fact that it is organic. The aroma and taste is further maintained by freeze-drying it. It can be served hot or cold as it dissolves just the same. Douwe Egberts is an instant coffee that is freeze-dried for that extra deep taste and aroma. It has a good balance and medium flavor making it favorable for drinking any time of the day. You may want to add cream, sugar, and milk to give your cup that extra flavor. This will highly depend on how you like to taste your coffee on a personal level. It is of medium roast and very smooth to taste. It is blended perfectly to suit every user and has no bitter aftertaste at all. The smell is heavenly while it is very rich in flavor. It is a perfect way to make your day as it gives you the best start you can imagine. Cafe Bustelo is a best- selling brand of coffee in some parts of the world. It is made by very high standards careful not to affect the taste and sweet aroma. This Instant coffee is very powerful and strong giving out a great deal of energy to the user. It is a black coffee that is very enjoyable just the way it is. The purity of this drink is a good addition to its flavor. It is dark giving it extra energy to last you the day. It is very affordable and of high quality. It is FDA approved and can be used for decaffeinated. It is considered as a healthy way of taking coffee. Mount Hagen is an organic instant type of coffee. Among the organically freeze-dried in the world, this is the first one to be certified. Thus being a leader in the market, you can also trust its good quality. It has a natural blend that brings out its deep flavor. This product has not been manufactured with any additives or preservatives. It is pure and fresh to taste. There are no artificial additives added to it while processing. This makes it a healthy drink to consume. If you desire you may add sweetener and milk for that personalized taste. It is very affordable adding value to your choice of instant coffee. The aroma cannot go unmentioned as well. This is a beautiful blend of coffee to start your day. It is Kusher certified and brewed organically for that personal and healthy touch. It is very economical as it can serve very many cups altogether. It is best for a quick fix on the go. It does well in the hot summer because you can serve it chilled and it tastes delicious. Not only is it organically prepared but freeze-dried as well. Mount Hagen Organic is separately prepared and harvested to give out that high-quality product. It is naturally rich and mild for that extra sweetness. It can be prepared very easily just by adding hot water. This is a good one for you to try. This coffee product is both a mix of a natural and artificial blend. It is a beverage mix that is made of Arabica coffee. It is a simple brewed coffee that has a great flavor. It has an aroma that smells very inviting. The taste is very sweet. In fact, if you have a sweet tooth this could be just what you need. It can also be great if you add cream or water. This coffee gives you a great way to start your morning. It has enough energy to last you all day long. It is delicious and also good on the go. It is good value for money and it comes in a large container that can serve you for a long period of time. There is nothing as refreshing as a sweet and strong cup of coffee in the morning. This mix of high-quality coffee is a sweet from of expresso that is so easy to love. It has been double roasted for that extra sweet taste and high quality. It has a rich flavor and does not disappoint with the lovely aroma. It is easy to prepare as all you need to do is bring water to a boil and mix in the coffee. You do not need to brew this coffee for it to give you great results. It is ready to go and good to use while traveling. There is a very intense flavor that comes out of this coffee that can be addictive. We certainly recommend that you try this one out. Medaglia D'Oro is an excellent taste of coffee that is double roasted. It doesn't hurt that it is very easy to make. Again you only need to mix with hot water and you are good to go. It is a great way to start your day with the energy boost you get will keep you going. It has an unusually rich aroma that feels the room with goodness. It goes very well with cream and has a delicious taste to it. The Medaglia d'Oro Instant Espresso Coffee can be used for both cooking and drinking. It is especially great for baking. In fact, any food that requires coffee flavor will do very well with this variety of coffee. This is an instant coffee that is freeze-dried in order to contain the entire flavor. It consists of mineral and multivitamin supplements that give your health that extra boost. It is a fully organic coffee that has a rich and dark flavor. The taste is heavenly and blends well with hot water or milk. It is easy to prepare and good to go anytime. When you are on the road you can carry this one along with you. It is very strong and gives out a distinctive aroma that will definitely get your attention. It will boost your energy levels and help you get through your day very easily. You may not want to pass this one. It is very delicious. This is a double roasted instant coffee that is very delicious and ready to drink. All you need to do is add hot water and star. It is rich and dark in flavor and has a very lasting taste. It does not have additives or any artificial flavors. It is made natural and organic. This is good for your health. Your metabolism is boost and energy levels increased at the same time. It is aromatic and unusually rich with a delicious taste to go with. You need to have this one near you, just try it. For a very indulgent and inviting cup of sweet vanilla taste coffee, you simply must try this one. It has both artificial and natural flavor. You get a fresh cup every morning as it has the entire flavor and rich aroma locked in. It is one of the best-crafted coffees simply made and easy to use. You only need to mix it with hot water, mix and enjoy. This instant coffee can be enjoyed on the go or at the comfort of your home. This Nescafe Taster's Choice Instant Coffee Beverage, Vanilla can be used anytime the day. It can be served hot or cold and you still get the same amazing taste. Does this coffee mix with cold water? How much caffeine is in one jar? Will this caffeine affect my health? Always read the label before using any type of coffee beverages. Caffeine may affect your health if you are hypersensitive. You do not have to spend time in a coffee shop for a cup of freshly brewed coffee. If you have the right coffee machine and the best instant tasting coffee brands, you can enjoy great tasting coffee drinks from home. The above Best instant coffees are from top brands and highly rated for the best brews. You can try any of them and I'm sure you will love taking your coffee.